Chip Kelly began his Oregon head coaching career in similar fashion. That turned out to be all right. Mario Cristobal’s start as head coach was a complete disaster and it leaves the Ducks going home with their tails in between their legs after a 38-28 nightmare loss to Boise State in the Las Vegas Bowl. Although the score was just a 10-point margin, it probably should have been much worse. The Broncos gave up two red zone turnovers that directly led to Duck touchdowns on the other end of the field. 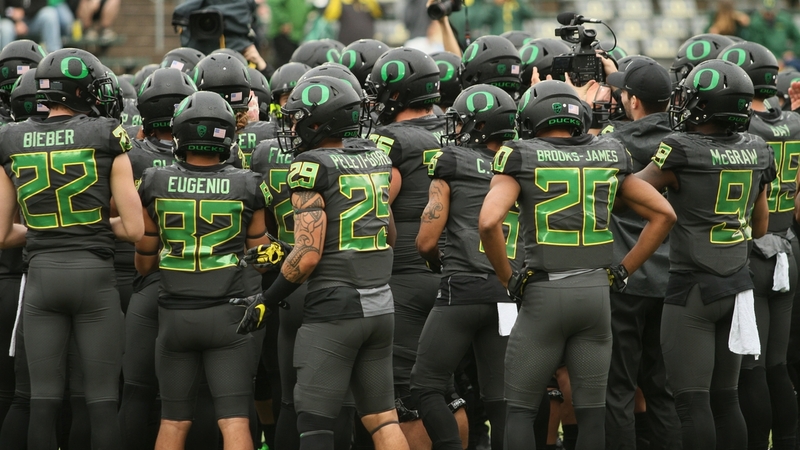 Instead of being down just 24-14 at the half, Oregon could easily have been down 42 or 45-0. Oregon scored with just 1:12 remaining to account for the final tally, but this was a beating in every sense. It’s been a tumultuous time for the Duck football program as former coach Willie Taggart bolted to Florida State just a few days after the Civil War. After a week of uncertainty of who will next lead the Ducks on the gridiron, athletic director Rob Mullens decided to officially make Cristobal the 34th head coach in Oregon history. The hire was lauded by fans and especially by the players, who signed a petition to make known Cristobal was their No. 1 choice. Unfortunately for Oregon, they didn’t play inspired football in Vegas, leading to their demise in Sin City. Having senior tailback Royce Freeman sit out to protect his draft stock didn’t help matters and only created an even bigger distraction. The Ducks could have used his nearly 6,000 career yards and 60 touchdowns against a tough Bronco defense that didn’t care about any of that. Boise State held the Duck offense to just 280 yards, but 75 of those yards came on their last possession. For the most part, Justin Herbert and company was shut down for most of the game. The sophomore’s 2018 Heisman campaign got off to a rocky start as Herbert was 26-of-36 for 233 yards, two touchdowns, but two interceptions, one being of the Pick-6 variety. Herbert had a tough time finding open receivers down the field as Boise State didn’t respect the Duck run game and it didn’t have to. Kani Benoit and Tony Brooks-James are both capable backs, neither are the back Freeman is and it showed. Those two combined for 24 yards on 15 carries. Despite what was a disaster on nearly every level, Boise State never could break away from the Ducks. It was 31-14 Broncos early in the fourth quarter when the Oregon offense briefly put it all together. Oregon went 78 yards on eight plays and scored when Herbert connected with Brenden Schooler on a 24-yard pass to cut the deficit to 31-21 with 10:07 left. But the Ducks could never make it a one-possession game. Boise State’s final nail in Oregon’s coffin came when the Broncos completed an 11-play, 89-yard drive that took off more than five minutes off the clock to make it 38-21 with just 2:22 left to effectively end the game. It was the first half that left everyone involved on both sides shaking their heads. The last 30 seconds of the first half might have been the best 30 seconds of football in Oregon history. It’s too bad the other 29:30 might have been the worst bowl performance in Duck history. With the scoreboard reading 24-14 Boise State at halftime, the Ducks might have felt that things could be better, but the game was far from over. It would have been a very different situation if Boise State didn’t commit two huge turnovers in the red zone in the last minute of the half. The first Bronco blunder occurred on a botched Statue of Liberty play with the ball eventually bouncing into Troy Dye’s hands. The sophomore linebacker then proceeded to rumble 81 yards for the touchdown to finally put Oregon on the board. Still up 24-7 with 45 seconds left in the second quarter, Boise State hit a 63-yard bomb to once again have the ball in the red zone. But on the next play, Oregon cornerback Tyree Robinson played a fade pattern to perfection as he stepped in front of the receiver and go 100 yards down the sideline to bring the Ducks to within 10 at 24-14. The Pick-6 that went the entire length of the field set an Oregon football record. Those two defensive highlights somewhat erased a terrible offensive half for the Ducks. Oregon turned the ball over four times, two interceptions and two fumbles. The Ducks could only muster 77 total yards in the first 30 minutes of action. Having Royce Freeman out and thus a lack of a sustainable running game didn’t help Herbert or the offensive as a whole. The Broncos could concentrate on stopping the passing attack by having seven or eight in the secondary and Herbert’s stats suffered for it. He was 10-of-15 passing for just 43 yards in the first half. 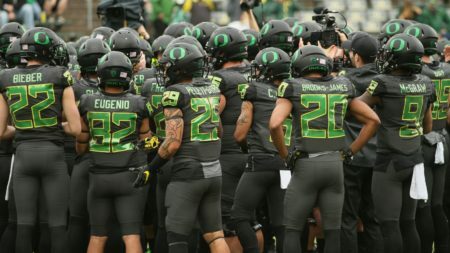 The loss ends a season that was one of the strangest ones in Oregon history. They had three head coaches in nearly one calendar year, had the season derailed when Herbert broke his collarbone and then defeated the Beavers by a record margin. Even though they lost today, Oregon should expect some stability with Cristobal at the helm and a strong recruiting class ready to sign next week. Most of the 2017 team does return with a Heisman candidate at quarterback and a weak schedule should provide a lot of exciting moments in 2018.